Dubai-based luxury hotel company Jumeirah is to launch a major new five-star city centre hotel serving business and leisure travellers to Frankfurt, following an agreement to lease and operate the hotel element of the city’s major new PalaisQuartier leisure and retail development, a project of MAB Development. The lease agreement was signed between Jan G.F. Eijkemans, Director of MAB Development Group BV, and Gerald Lawless, Executive Chairman of Jumeirah Group in Frankfurt/Main yesterday. The agreement will see the 219 room luxury hotel launching in mid-2010 alongside the launch of the 112,000 m2 Palais Quartier mixed use office and retail complex. 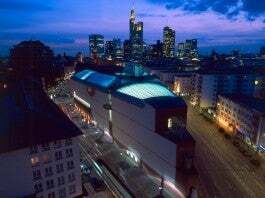 Palais Quartier is located at the heart of Frankfurt at the Thurn-und-Taxis-Platz, within walking distance of the city’s financial district and stock exchange, pedestrian shopping areas and the city’s opera house. The mixed use development includes the reconstructed baroque 18th century Thurn und Taxis Palais and a 48,500 m2 retail development, some 42,000 m2 of premium office space and the 22,000 m2, 25-floor Jumeirah Hotel Frankfurt. The retail component, called MyZeil and designed by Massimiliano Fuksas, recently opened with great success. It is fully let and attracted over one million visitors during the first two weeks after opening. “The level of hospitality and luxury the Jumeirah Group brings to their luxury hotels, fits perfectly in the Palais Quartier project. We are delighted to welcome Jumeirah to Germany and are proud that we are able to accommodate the hotel in our project in Frankfurt,” said Eijkemans. Guests of Jumeirah Frankfurt will enjoy a range of facilities including Jumeirah’s signature Talise spa as well as several restaurants and bars, meeting rooms and business facilities. The hotel will include a contemporary fine dining restaurant with a design commissioned from leading Japanese designer Takashi Sugimoto and his team at Super Potato, one of today’s most respected and innovative restaurant design consultancies. The overall interior design will be in responsibility of Peter Schilling & Associates and the building design has been completed by the German architects KSP Engel und Zimmermann. Both partners acknowlegded the efforts of the WingField Corporation to conclude the agreement. “The Jumeirah Frankfurt Hotel is an important development in our company´s global expansion plan. It will serve Germany’s financial centre and one of Europe’s most important international business and travel hubs. Germany is one of the world’s largest economies and a market that has traditionally served as the third largest inbound market for Jumeirah’s properties. It’s a key market for us and we see this first move to invest in the German market as an important and sound link that cements an already strong connection,” said Lawless. ”I am immensely pleased by this further revitalisation of the Frankfurt hotel sector” enthused Petra Roth, Lord Mayor of the city of Frankfurt. “The Jumeirah Group’s decision to select Frankfurt, especially in the current economic climate, is a particular indication of their trust in our city and its future viability and sustainability. Hotel operators invest in Frankfurt because of its international character, its prosperity and its innovational energy.“ Frankfurt is very interested in strengthening its relationship with the Gulf States. With this new five-star hotel, from a company in our partner city Dubai, we will strengthen the potential contact to other partners in this region“.